This test repeats the same words, once with no modulation, then several times with the carrier signal at different frequencies. The last sample was created by increasing the frequency of the carrier oscillator while the words are being spoken. Each repetition is the same exact wav file, so all of the variation is caused by the ring modulator, not the person speaking. For this test, we used a nice clean triangle wave from a software synthesizer as input. Again, the first time is with no modulation, then several times with the carrier signal at increasing frequencies. 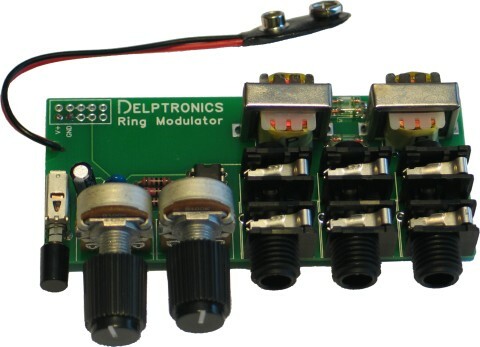 You have probably heard a ring modulator in use, even if you have never heard the term. It was most famously used to create the voice of the Daleks on Doctor Who. Two incoming signals (referred to as the input and carrier) are multiplied and the output is the sum and difference of the two frequencies. Most often, a sine or triangle wave is used for the carrier signal. When modulating a voice, the effect sounds "robotic" and is similar to a vocoder (in sound, not operation). There are tons of effects that can be achieved by varying the two input signals. Using the same signal for the input and carrier has the effect of multiplying the frequency. You can also feed in a dry signal for the input and use the same signal through a delay for the carrier. Lots of combinations can be used to get a variety of effects. There are many different circuits use to create digital ring modulators, including using DSP (digital signal processor) chips. This one is the classic passive ring modulator which uses nothing more than two audio transformers and four germanium diodes - and no power. That is why it is called a passive ring modulator. There is also an on-board triangle wave oscillator for the carrier signal that is switched off when you plug a source into the carrier jack. Here's some video from the Handmade Music Austin workshop where we built a bunch of Ring Modulator kits and had great fun patching every noise-making gizmo we could find through them. Weird sounds abound! The circuit board was designed for versatility. It can be used either bare-board, or mounted. The jacks, knobs and switch all face one way for easy mounting in an enclosure or rack panel. A drill template is included with the kit. The board has holes for 1/4 inch or 1/8 inch jacks and you can order it with either size. The on-board oscillator can be powered either by a 9 volt battery, or by 12 or /15 volts. For Doepfer standard powered modular systems, just add a 10-pin header. You can even cut the board in half if you want only the passive ring mod section and not the oscillator!